Synopsis: Captain Jack Sparrow searches for the Trident of Poseidon. The Pirates of the Caribbean franchise has been an interesting one for me. I really enjoyed the first film, the second film was okay for what it was and the third film felt like it was an hour too long – I don’t even acknowledge the last film. So, when Dead Men Tell No Tales was announced I was a little hesitant about watching it. But, then they released the first teaser and I loved it. It gave me some faith for the new film. Now after watching it, I was kind of right. Dead Men Tell No Tales isn’t a return to form, but it does make some of the right steps to bring it back. The film starts off with a young Henry Turner, the son of Will Turner (Orlando Bloom), who goes out every night to find his father and tell him he’s going to find a way to break his father’s curse. The only way to do that is to find the Trident of Poseidon, which is said to give the bearer total control of the seas. We skip forward in time and find out someone else besides Henry (Brenton Thwaites) is trying to find the Trident in Carina Smyth (Kaya Scodelario), an accused witch – who’s really an astronomer. 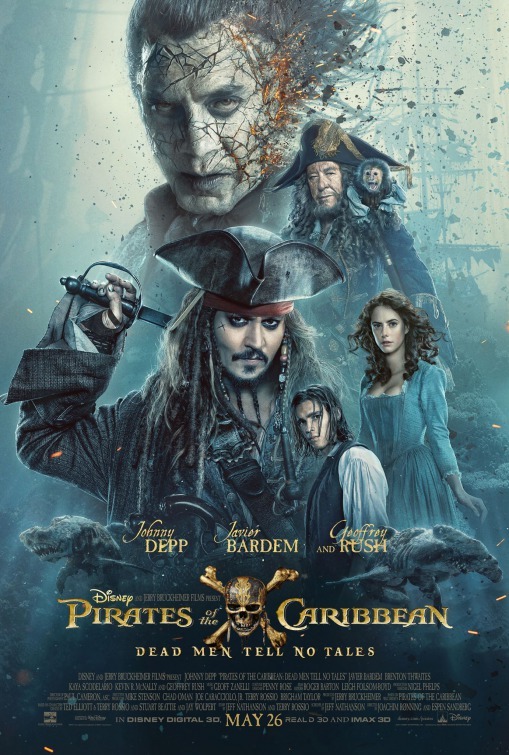 However, their search for the Trident gets them mixed up with the undead Captain Salazar (Javier Bardem) who has been broken free of his confinement and Captain Barbosa (Geoffrey Rush), who is once again a pirate trotting the seas with his new crew collecting treasure. Of course, all of them have one person in common: Captain Jack Sparrow (Johnny Depp). Dead Men Tell No Tales feels like the first film. There’s a blooming romance between Henry and Carina, although it doesn’t help that Thwaites isn’t a great lead actor. Also, the film makes sure that Johnny Depp isn’t the main character – sure he’s the big name of the film and Jack Sparrow has become a pop culture figure, but Jack wasn’t the real lead in the Pirates films, it was who he was following – another reason why Stranger Tides didn’t work. Speaking of Depp’s Jack Sparrow, he’s essentially become a parody of what the character was from the first film which is a shame because his character doesn’t really add anything to the franchise anymore and comes off as a bit annoying. Although, the name of Captain Jack Sparrow is essentially what it’s become in the movie – a revered pirate is nothing more than a drunk, selfish lowlife that is a shell of his former self. The rest of the cast is fine with Javier Bardem playing a fine villain, who is dead because of Jack before he became the infamous pirate we saw in Curse of the Black Pearl. Geoffrey Rush is always having fun playing Barbosa, but he gets to add some of his more dramatic chops and is also involved in a shoehorned in storyline that could have been more effective if it was touched on earlier than it was. Orlando Bloom and Keira Knightley do appear in glorified cameos that don’t really add anything to the story, other than Bloom’s scene with a young Henry. All in all, Pirates of the Caribbean: Dead Men Tell No Tales is much better than the last film as it follows other characters that aren’t just Jack Sparrow. The film does lack some awesome sword fights and ship battles that made the first two films so great, but Dead Men Tell No Tales is a promising return to form if Disney decides to do more. Synopsis: Devoted lifeguard Mitch Buchanan butts heads with a brash new recruit. Together, they uncover a local criminal plot that threatens the future of the Bay. When you think of Baywatch, what do you think of? 90s cheese? Slow-Mo? Good looking people in tight bathing suits? Yeah, all that sounds right. So when it was announced that a movie was being made, everyone acted like “how dare they” acting like Baywatch was this sacred brand that shouldn’t be touched. With the vein of 21 Jumps Street and some cheese factor, Baywatch is here and it’s a mixed bag of humor and cheese to make you want to run in slow-mo all over again. Well, maybe. Baywatch follows Mitch Buchanan (Johnson), the hero and popular face of Emerald Bay, who along with Stephanie Holen (Ilfenesh Hadera) and CJ Parker (Kelly Rohrbach) are looking for new recruits to watch over The Bay. The eager recruits are Summer Quinn (Alexandra Daddario), nerdy but heart full of gold Ronnie Greenbaum (Jon Bass) and the disgraced Olympic swimmer Matt Brody (Zach Efron), who is there for not only a publicity stunt but to spend his probation out. Brining in the new recruits isn’t the only thing Mitch has to worry out, when drugs and bodies start piling up around the beach, Mitch gets the feeling that new powerful businesswoman Victoria Leeds (Priyanka Chopra) is behind it all. What follows is Mitch leading his team to get to the bottom of it, while butting heads with local cop Sgt. Ellerbee (Yahya Abdul-Mateen II). Now look, you’re going to watch a Baywatch movie, so don’t go in pretending you were going to get fine and artsy cinema. It’s cheesy as hell, but it knows exactly what it is and doesn’t try to act like a movie that it isn’t. Hell, Zac Efron’s Brody makes a joke that the villain’s plot and the crew’s attempt to stop it sounds like a TV show. 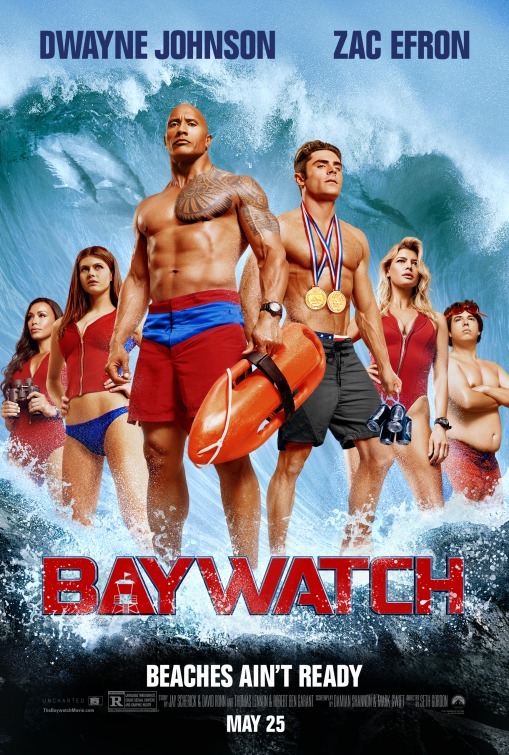 Furthermore, let’s face it, it’s a Baywatch movie, plot isn’t something we’re striving to see. The cast is pretty serviceable here. Johnson is the charismatic leader that spits out insult after insult to Efron’s Brody, and is bound by duty to protect the beach at all costs – even though it’s not really his job. Efron’s Brody is the conceited, good looking new guy that learns being a lifeguard is more than keeping people from drowning, Jon Bass is a pretty great highlight playing bumbling nice guy Ronnie, who has a thing for CJ, played by Kelly Rohrach, who isn’t too bad and is involved in one of the romance subplots between her and Ronnie. Alexandra Daddario’s Summer gets to play along with Johnson and Efron’s hijinks, but is still underdeveloped as a character, which also goes for Ilfenesh Hadera’s Stephanie, who feels like she’s second-in-command within the crew, but disappears at times and really doesn’t do anything. Priyanka Chopra plays the villain Victoria Leeds, who surprisingly holds her own – especially considering I’ve never seen her in anything. Yahya Abdul-Mateen II’s Sgt. Ellerbee is also great in his local cop role who’s always reminding team Bayatch that they are just lifeguards and not a police force. Hannibal Buress and Rob Huebel pop in as a tech guy whose friends with Ronnie and the head of the Baywatch unit, respectably. Of course, there are cameos by Pamela Anderson and David Hasselhoff. All in all, Baywatch has its really strong moments, but it all really depends on if the humor grabs you. Some of the jokes don’t work, and some really overstay their welcome. A lot of Baywatch is also a little underdeveloped, which almost isn’t that much an insult, since again, it’s a Baywatch movie – but it’s still not okay. Synopsis: A young street artist in East Los Angeles is caught between his father’s obsession with lowrider car culture, his ex-felon brother and his need for self-expression. Lowrider culture may not be as huge as it was back in the day, but in some circles and cities – like East Los Angeles – it still is alive and strong. However, even with the name Lowriders in the title, the film isn’t just about the cars, it’s about this specific family we follow that we can probably connect to in our own way. 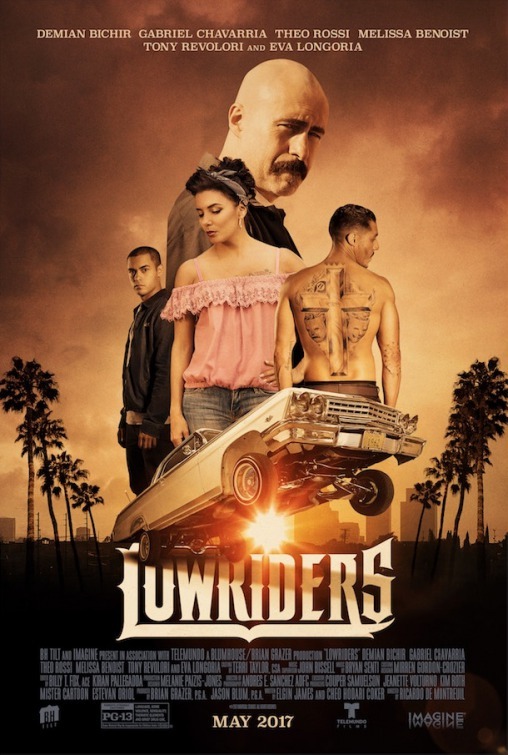 Lowriders may not have gotten a nationwide release or have been promoted that much, but it’s one of those smaller movies that you should try to watch if you can. Lowriders mainly follows Danny (Gabriel Chavarria), the youngest son of Miguel Alvarez (Demian Bichir), who would rather put his graffiti art all over the city than follow his father’s passion of lowriders. 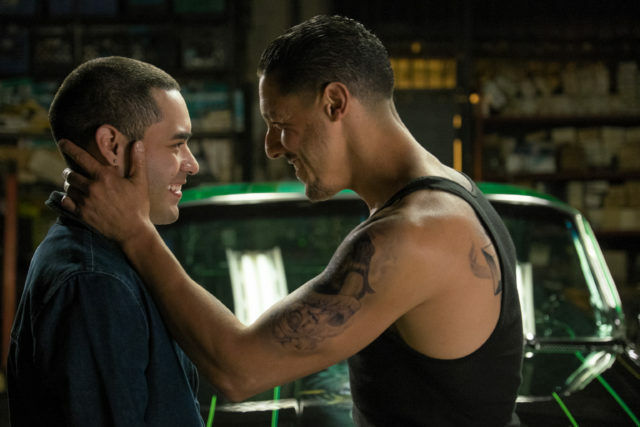 This fractures the relationship between the two, and things only get worse when the older brother, Francisco (Theo Rossi) or ‘Ghost’ arrives – who has an even worse relationship with Miguel – after getting out of prison. Ghost convinces Danny to come work with him at his rival shop to his father before a big lowrider competition, building the wedge bigger between the Alvarez men. Meanwhile, Danny starts a relationship with a photographer named Lorelai (Melissa Benoist), and Miguel deals with his new wife, Gloria (Eva Longoria), who wants him to make up with his sons. I didn’t have any real expectations for Lowriders to be honest. I thought it would be one of those small films that would be forgotten about or would be okay to watch at the time – boy was I wrong. The film isn’t perfect; some details could have been fleshed out more or resolved better like the relationship between Danny and Lorelai, which does dive into social commentary that stalls the film and take you out of it. Then there’s Theo Rossi’s Ghost, there are times that he goes a bit too over-the-top, but there’s also a moment that Ghost orchestrates that takes the film to arguably a tipping point, but thankfully the rest of the film saves it from being that. The cast itself does their finest to get everything across. Gabriel Chavarria’s Danny struggles with choosing sides, but never forgetting his art. He’s stuck between two worlds and one that isn’t easily accepted by his father. It’s a nice play on the family drama that is cemented by Demian Bichir playing the quiet, tough and hardheaded father who can’t talk to his sons, but still wants them to respect their heritage. Melissa Benoist doesn’t add too much to the film, other than adding to Danny’s story of figuring out who he really is and which side he should embrace. Tony Revolori and Yvette Monreal play Danny’s friends Chuy and Claudia that don’t get enough screen time as they should. Finally, Eva Longoria’s Gloria also doesn’t get enough screen time, but her scenes with Bichir are great and some of the more dramatic scenes come when they are together. All in all, Lowriders is a much better film than anticipated. While the film could have punched up some aspects of the film, the family drama and coming-of-age story blend together nicely with lowrider culture and someone trying to find a balance of keeping their heritage and being themselves. I’m going to start off the review with this, I didn’t mind Prometheus. Was it a perfect film? No, it wasn’t, and even I can see the faults the film had. But the amount of bashing and hate the film received when the film was released was a bit too much. One of the problems that I do wholeheartedly believe was wrong with Prometheus wasn’t in the movie itself, it was the audience. I get it, it’s hard not to get really excited over a film. I do it, and I’m sure you do it too. But I remember the hype level for Prometheus and it was ridiculously over that I shut myself out from reading anything about the film before it came out. And I get it, I do, Alien has a special place in many people’s hearts – as it should – but people got themselves way to hyped up that they were disappointed with Prometheus because it wasn’t what they thought or wanted it to be. So this brings us to Alien: Covenant. Not only is the film a sequel to Prometheus it’s also more of a step closer to reaching the point we saw in Alien. 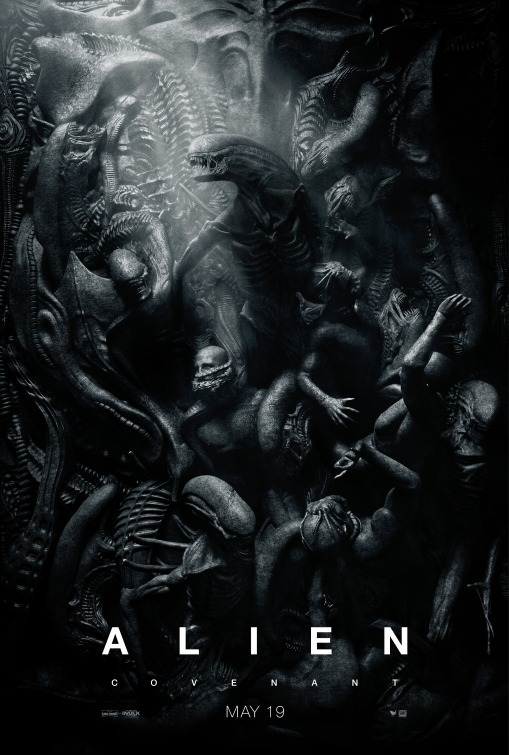 Not only is the film a continuation of what we saw before, but they go back to the early roots – a sci-fi horror film with the famous Xenomorph we have all learned to fear and love. Covenant follows the colony ship called The Covenant, which is filled with couples, that is on the way to a new planet to start a new life. The only person awake and not in cryosleep is the android Walter (Michael Fassbender) who, like his predecessor David (also played by Fassbender), watches over the ship. However, an accident occurs that causes Walter to wake the crew members which results in some of them dying, including the captain. While the crew makes repairs they receive a mysterious transmission from a nearby undiscovered planet that is also perfect for them to inhabit. This leaves newly appointed, and untested, captain Oram (Billy Crudup) with a tough decision: go to the unknown planet that sent the transmission or continue the original course – of course, there wouldn’t be a movie if he chose the latter. The decision isn’t met with much agreement from the ship’s second-in-command, and chief terraformer Daniels (Katherine Waterston). As we see in the trailers, a group heads to the planet seeing it as a perfect replacement, but soon they discover the origin of their transmission – the ship from Prometheus. As they try to explore more, two of the crew members get sick and as they try to head back they get stopped by the new creations Neomorphs, which of course, come bursting out of the sick crew members. The remaining members get saved by a mysterious figure who tells them to follow him. Skipping ahead, they discover that it’s David who is the only surviving member of the Prometheus. The crew later find out that the planet isn’t really all that safe. Alien: Covenant is hard for me to judge. Almost like Prometheus, this movie is good until it isn’t. Ridley Scott knows how to direct sci-fi films, and the visuals here are pretty damn great, along with the combination of the landscapes that are beautiful, but the problem comes to some of the characters. While Prometheus didn’t focus on all the characters, you at least knew what all of them did. Covenant missteps on that a bit, as it only focuses on the bigger characters, making every other character just a prop for the Neomorphs and the Xenomorph to kill. Fassbender is great once again as the androids David and Walter, and kudos to Fassbender for making the two vastly different in every way. Katherine Waterston joins the Alien franchise of female leading ladies, but her character only gets the time to shine when David or Walter aren’t around. Billy Crudup’s Captain Oram is a mixed bag and doesn’t really get earn his place until one of the bigger moments of the film – and I’ll be interested in seeing how people take and accept that scene. Danny McBride would be the next, and potentially final, big character in the film as one of the Covenant’s pilots named Tennessee. Surprisingly to some maybe, McBride does crack jokes in the film, but is one of the more grounded and down-to-earth characters in the film. 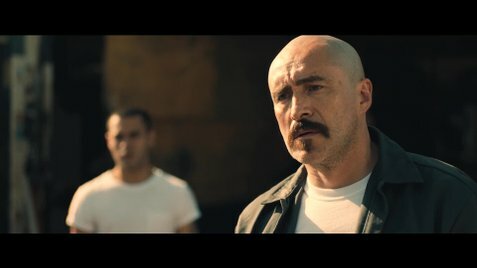 The rest of the cast is pretty much cannon fodder, Demian Bichir plays Lope, one of the head military leaders, who is actually in relationship with Hallet (Nathaniel Dean), but it never pays out as it should. Camen Ejogo plays Oram’s wife and biologist, who believes in Oram that he can lead the crew in a good direction, Amy Seimetz plays Faris, Tennessee’s wife, and the other pilot of the ship that is probably the best of the supporting characters, but she doesn’t get enough screen time. Covenant does have the feeling of an Alien film, with the suspense, but it’s not as revved up as it should have been. Even the action scenes aren’t all that great and they end pretty quickly, which is a shame considering the previous Alien battles. 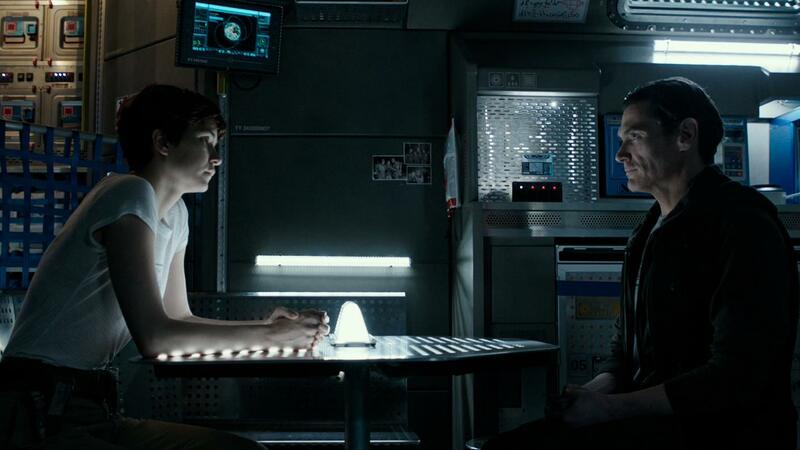 When it focuses on the themes bought up in Prometheus, it extends them and while I won’t go into them in details – due to spoilers – it all comes down to David. All in all, Alien Covenant is a frustrating movie. It’s a good movie until it isn’t, and when it becomes a bad movie it’s hard to get out of it. However, the big thing that does make me angry and disappointed, is some of the things bought up in Prometheus are not fleshed out or are completely erased which makes Covenant in some ways another rehash of ideas. I would still recommend Covenant to people, but keep your expectations low. Welcome to another edition of Mini-Reviews. Been a while since I’ve done one of these, so please, bare with me. So let’s get to it, shall we? Snatched follows Emily (Amy Schumer), who has not only been fired from her job, but also gets dumped by her boyfriend (Randall Park) and has booked a non-refundable trip to Ecuador. This leads her to go to her overly cautious mother, Linda (Goldie Hawn), to go with her especially after discovering an old photo album that showed a younger Linda on adventures. When Linda finally breaks down, the two end up in Ecuador where they meet a pair of tourists Ruth (Wanda Sykes) and her partner Barb (Joan Cusack), who was in the Special Forces. However, Emily connects with a good looking stranger, James (Tom Bateman) who shows her a good time before taking her and Linda to see the rest of the island. The three end up in an accident with Emily and Linda being held captive, and having to find a way to escape. The film surprisingly works when it completely goes for ridiculous moments, rather than quick-witted humor. In fact, the ridiculous moments actually made the film more bearable for me to watch. I’ve admitted that I’m not the biggest Amy Schumer fan, but I didn’t let that effect the way I watched the film, and with that said, Schumer isn’t even the funniest person in her own movie. Schumer’s Emily could come off as unlikeable and annoying, and I wouldn’t blame you, but her relationship with Goldie Hawn’s Linda is the main focus of the film. The mother-daughter dynamic starts off almost immediately and isn’t that bad, but the real deeper moments are far apart and actually feel real and not forced. Its arguments you can with our mothers and the resolution isn’t really always there and a quick answer. Schumer and Hawn handle those scenes so perfectly that for just a brief second you forget the comedy aspect of the film. One of the things that makes Snatched work is the supporting cast, mainly the chemistry and scenes between Ike Barinholtz’s agoraphobic adult son Jeffrey and a State Department official Morgan Russell played by Basir Salahuddin. Anytime the two are on screen, you will be laughing hard – I know I did. Then there’s Christopher Meloni’s character, Roger Simmons, who I won’t spoil, but I’ll just say this – he’s a great and welcome addition to the ridiculous that is this movie. The same can’t be said for Oscar Jaenada, who plays the man in charge that kidnaps Emily and Linda, is wasted in the film, but it isn’t his film to begin with so I can forgive that. All in all, Snatched works when it’s over-the-top. Not all the jokes work, and even the ones that do are a little iffy. Even though Amy Schumer is the lead in the film, the supporting cast is what makes this movie work on the levels that it does. Synopsis: Robbed of his birthright, Arthur comes up the hard way in the back alleys of the city. But once he pulls the sword from the stone, he is forced to acknowledge his true legacy – whether he likes it or not. King Arthur: Legend of the Sword starts off with a lengthy opening credits scene showing off Arthur’s father Uther (Eric Bana) facing a powerful Mage attacking his castle. It gives us a tease of the power of the sword Excalibur. After his battle, Uther’s brother Vortigern (Jude Law) plans a coup and kills Arthur’s parents, but not before they were able to send a young Arthur down the river. We jump forward in time and find a now grown up Arthur (Charlie Hunnam), who grew up in a brothel, and with his two friends Wet Stick (Kingsley Ben-Adair) and Back Lack (Neil Maskell) have a good thing going. They protect the girls at the brothel, and take a little bit of money from people on the street. However, when the seas by the castle start to recede, they reveal Excalibur, and Vortigen finds out that the sword has found a new person to wield it and use it against him. The search wages and eventually Arthur finds his way there. When he pulls the sword from the stone and instantly becomes a target and a legend among the people. Arthur is then saved and works with his father’s old allies in Bedivere (Djimon Hounsou), Goose Fat Bill (Aidan Gillen) and The Mage (Astrid Berges-Frisbey). What follows is Arthur coming to terms with not only learning to use the sword and defeat Vortigern, but become the legend the people think he is. Legend of the Sword has many things working for it. The Guy Ritchie touch is welcomed to a story we’ve heard, read and seen numerous times. One of the best moments in the film is when Arthur and his friends are recounting a story about a troublesome group and what happened – it’s Guy Ritchie at his finest. In fact, the film works better when it’s not focusing on the mystical side of things. Seeing Arthur as a street-level grounded character was a good way to go with his concept. That’s not to say some things don’t work. When the film goes all in on the mystical side of things, some of it stumbles. The idea that humans and Mages are at war – said at the beginning of the film – doesn’t really pay off for the rest of the film. Other than Vortigern having some powers and the character The Mage, that part isn’t really brought up again. Even some of Voritgern’s powers that are introduced don’t really make too much sense or are never really developed. Speaking of Vortigern, Jude Law does an okay job, but his character isn’t really all that fleshed out. When it comes to the rest of the cast, Charlie Hunnam does fair job as Arthur. 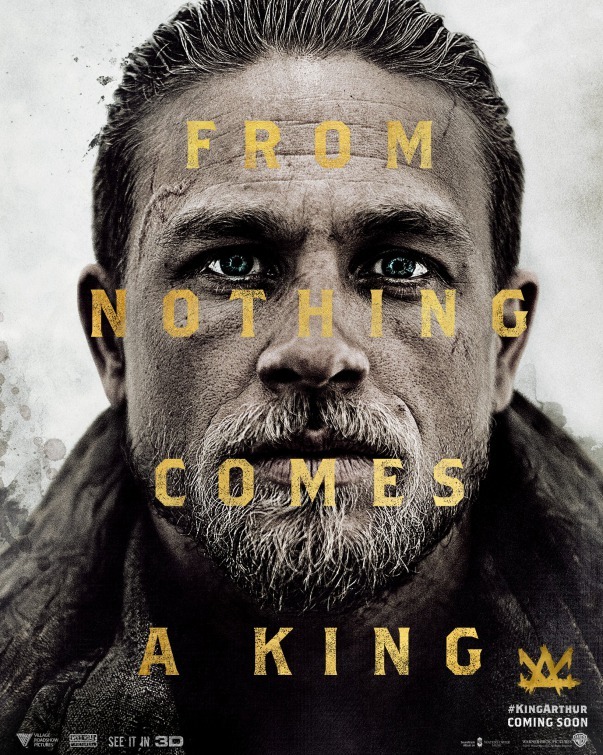 Obviously, it is a different take on Arthur, and Hunnam’s performance is connected to the sword as it shows him the last moments of his parents, which already keeps him up at night. Also, his chemistry with Ben-Adir’s Wet Stick, Maskell’s Back Lack and Bleu Landau’s Blue (son of Back Lack) works really well. Astrid Berges-Frisbey’s The Mage, keeps her cards close to the vest, but her powers are on full display throughout the film. Djimon Hounsou and Aidan Gillen are there to add a boost to the supporting characters, and do a find job at that. The third act of the film however, is when Ritchie falls into summer box office territory. It goes completely over-the-top with the special effects and mystical side of things. It also gets a little hard to follow and feels a bit out of place even within the perimeters that film has set for itself. All in all, King Arthur: Legend of the Sword isn’t all that bad. There’s a lot of good concepts within the film, and although some things don’t really work out or are either underdeveloped or not fleshed out enough, the film never falters too much. Needless to say, this isn’t your parents King Arthur. It’s been a bit since I’ve posted the podcast on here – at least regularly. Going to be fixing that. Synopsis: The team’s adventures continue as they unravel the mystery of Peter Quill’s true parentage. Back in 2014, everyone was surprised by the success of, and how great, the first Guardians of the Galaxy was. The film was filled with characters not many people knew about, and everyone was saying this was going to be Marvel’s first failure – Nope! We all fell in love with the wonderful batch of misfits, a walking tree and a vividly colored galaxy while a cool soundtrack played throughout. 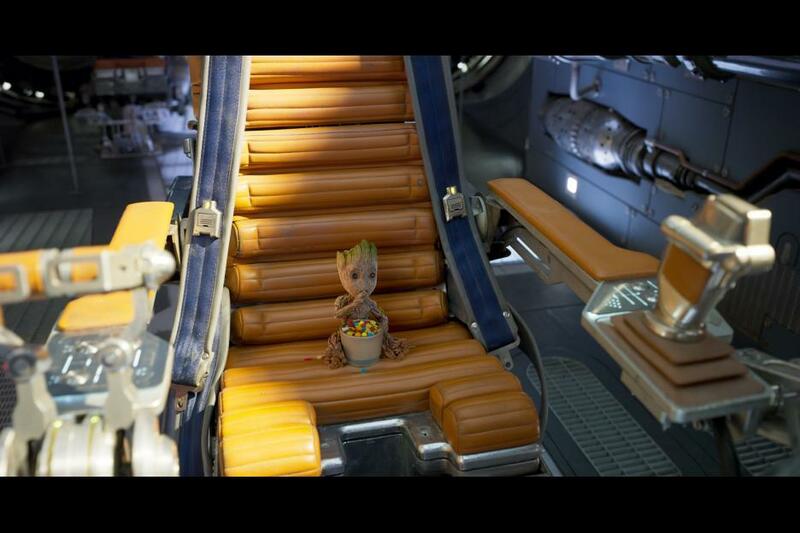 So as the sequel approached – and showed off Baby Groot – the film jumped to almost everyone’s must-see list. So does the sequel live up to the expectation? Yes. Vol. 2 begins by showing us a scene on Earth in the 80s with Ego (Kurt Russell), although we don’t know his name yet, and a returning Meredith Quill (once again played by Laura Haddock). 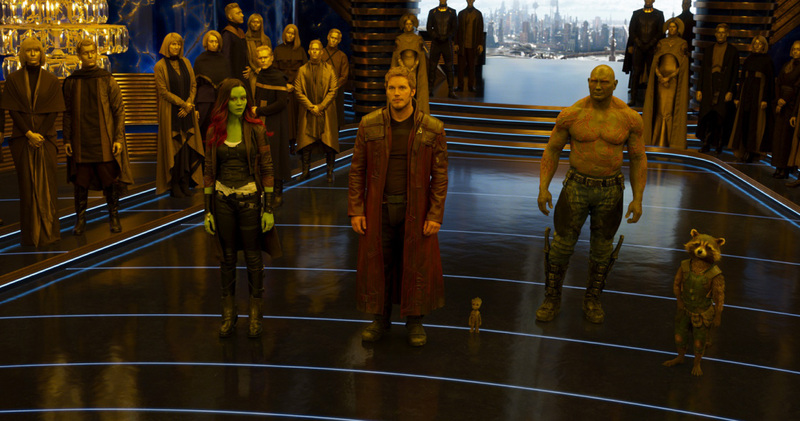 We then jump to the present which shows off the Guardians – Peter Quill/Star-Lord (Chris Pratt), Gamora (Zoe Saldana), Drax (Dave Bautista), Rocket Raccoon (voiced by Bradley Cooper) and Baby Groot (voiced by Vin Diesel) – who have been hired by the High Priestess of the Sovereign, Ayesha (Elizbeth Debicki) to protect a cherished battery core from a space beast for the exchange of Nebula (Karen Gillan) aka the highly promoted scene. When the Guardians defeat the beast they go on their merry way – of course – something happens which ensues a space battle. When all hope looks lost, the Guardians are saved by a mysterious figure, Ego, and his companion Mantis (Pom Klementieff). 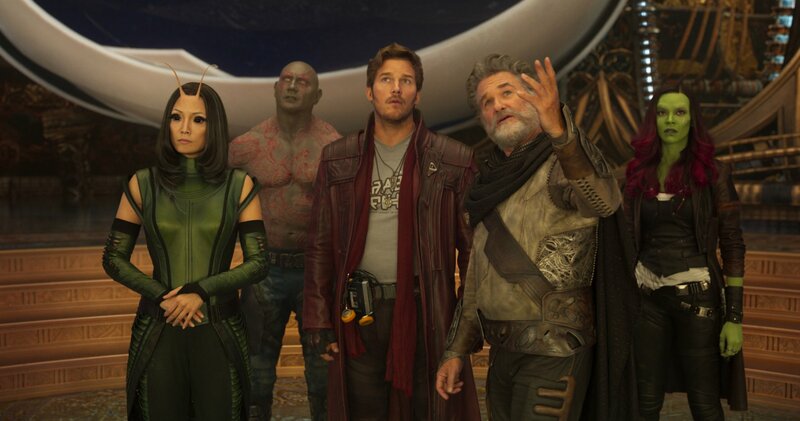 Ego tells the Guardians that he is Peter’s father, which leads to some doubt, but Peter is convinced by Gamora to see if Ego is who he says he is. 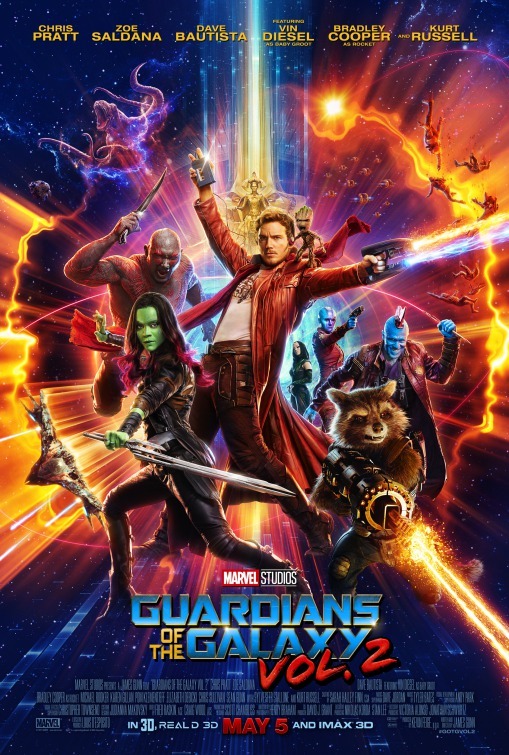 Followed by Drax, Peter and Gamora head to Ego’s home planet while Rocket, Baby Groot and Nebula are left behind to make repairs on the ship – and they run into their own troubles with the Ravagers lead by Yondu (Michael Rooker), Kraglin (Sean Gunn) and Taserface (Chris Sullivan). What follows isn’t just a Marvel action adventure, but a more personal and emotional film that I don’t think many were really expecting. Much like the first film, Vol. 2 is chalk-filled with humor, big action set-pieces, and is a hell of a lot of fun – of course it’s punched up to eleven for the sequel. The humor is scattered throughout the film with everyone getting their fair share of one-liners and quips, but unlike the first film, Vol. 2 does stumble in keeping the humor spot-on. A small portion of the jokes feel a bit forced for the sake of having a humorous moment, but is put right next to an emotional beat which strips the beat of its meaning sometimes. The jokes are great, but even I’ll, it didn’t need all of them in there. Of course, the biggest focus in the film is the family aspect. We all got a good grip of who these characters are in the first film, but director and writer James Gunn does a tremendous job of fleshing everyone out more to really get down to the core. 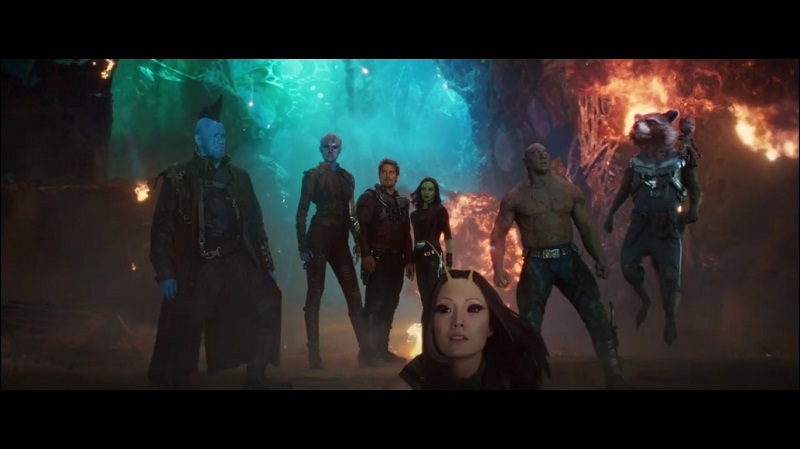 Gamora and Nebula’s relationship finally gets some time to shine (although I would have loved some more time to be honest), Drax’s family is brought back up with Mantis in one of the best pairings of the film and one of the smaller moments of the two films as well, the unlikely pairing of Rocket and Yondu works surprisingly well and finally, Peter and Ego. Peter and Ego’s relationship is the driving force of the film and makes the film go from sci-fi adventure epic to family drama. Of course for Peter is finally finding his father and seeing if this powerful being and charismatic man is truly his father, and if he is, why did he leave his mother? Why did he never come back to Earth and pick him up personally instead of sending Yondu? These questions are answered, but they also bring another set of questions and answers that Peter may not be ready for. It’s a great dynamic, but also one that I would have loved to see a bit more of. 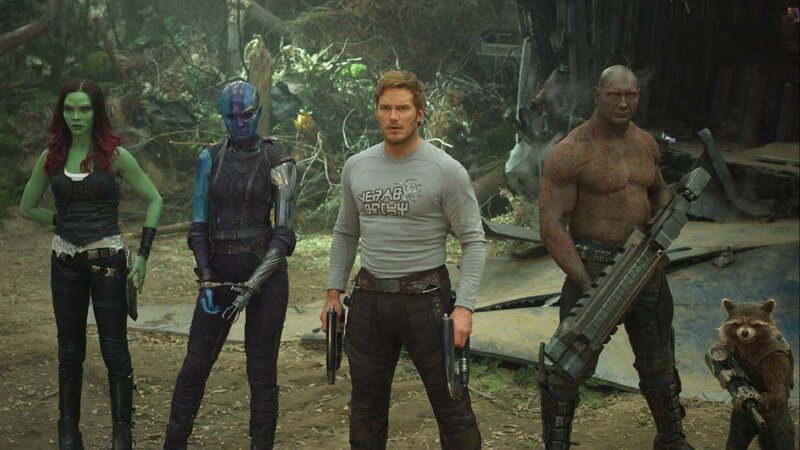 However, one big highlight from the cast, besides Baby Groot of course – I mean, come on, look at him!, is Michael Rooker’s Yondu. His arc in the film is arguably the best one in Vol. 2 and Rooker handles the character gracefully and never lets up until the end of the film. 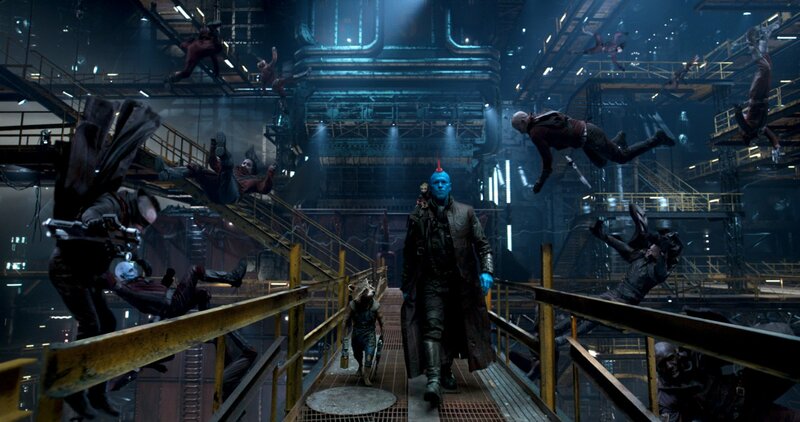 I won’t go more, although I want to, but say what you will about the cast, Rooker’s Yondu is the best character in Guardians of the Galaxy Vol. 2. Another big highlight is the special effects. Gunn didn’t hold back at all upping everything up to eleven, and when we get to Ego’s planet the film’s color spectrum is all over the place. We never really feel lost when you’re there and even the background images and shots look fantastic. It’s the ending however, where Gunn really shines in the special effects, it’s really quite remarkable really. All in all, Guardians of the Galaxy Vol. 2 is a great fun ride with bigger set-pieces, special effects, humor, character depth and emotion. Is it better than the first film? Well, I’ll leave that up to you, but there are certain parts that will make certainly make you think that. There’s also a ton of easter eggs and cameos that fans will love. Moreover, there is one big scene that I can’t believe Disney let James Gunn put in. It’s one for the fans that they’ve probably wanted to see for a while, and one that left me pretty dumbstruck. I guarantee one thing, you’ll leave with a smile on your face.